The two heavyweights meet again! Real Madrid and Bayern Munich are the two dominant teams this year and both have, just about, equal odds of winning the Champions League. Real Madrid are coming into this match rested. They re-scheduled their game on the weekend to charge batteries. They played last Wednesday vs. Barcelona in the Copa del Rey (King's Cup) final, where Gareth Bale's stunning goal won it for Los Blancos. Cristiano Ronaldo is fit to play after missing a few games due to injury. Sami Khedira is also back in the picture. He was out for a long time with a torn ACL. Real Madrid are amped to get their La Decima (tenth Champions League trophy) this year. Bayern Munich won the German Bundesliga in record time. Then they battled Manchester United in the Champions League quarter-finals and won. They did not impress against the struggling United, but they did show signs of brilliance when it mattered the most. Since then, they have been on and off. They lost couple of league games, one of them vs. Borussia Dortmund at home with the score of 0-3. Most recently they won their cup semi-final vs. Kaiserslautern and a league game vs. BTSV. What could be going on at Bayern? Last week, someone said ' Pep doesn't do friendlies!'. That just might sum it up. Real Madrid are the favourites to win at home, while the last year's champions, Bayern, are the favourites to advance to the final for the third consecutive time. The teams met two seasons ago, at the same stage of the competition. Bayern won on penalties after both matches finished 2-1 for the home side. The upcoming game could be the most-watched football match so far this year! 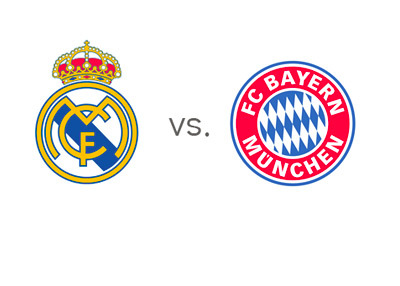 The return will be played on Tuesday, April 29th, 2014 at the Allianz Arena in Munich.